The bid process takes time due to meeting with potential contractors, collecting the bids, evaluating the bids, making potential bid revisions, and awarding the contract. Typically the larger the facility, the longer the bid process takes. Proper planning and preparation. A lot goes into managing the snow and ice on commercial sites. Timely service doesn't happen without planning and preparation. 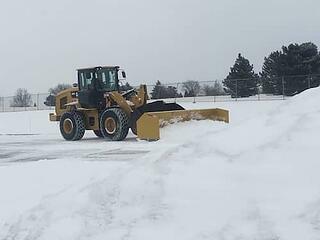 Snow contractors need to create routes allocating their manpower and equipment, purchase materials, prepare their equipment, and conduct pre-season meetings/training. Unpredictable weather. The snow could start flying before Thanksgiving or after Christmas, it's Northeast Ohio. Starting your bid process in August should give you sufficient time to award the contract in September and give your contract at least a month for that proper planning and preparation. At Turfscape we have already started preparing for the winter season. We have been securing salt and calcium, preparing our renewal contracts, and evaluating our equipment and manpower needs. If you would like to discuss the snow and ice management services for your facility, contact us.